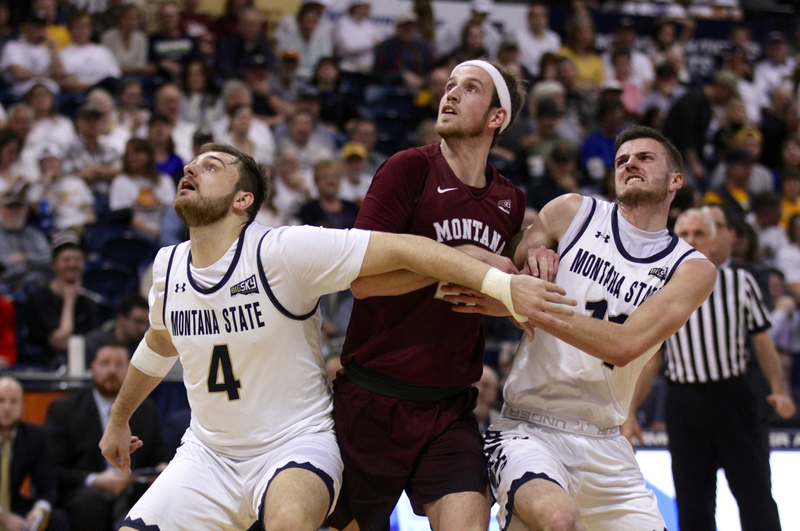 With under two minutes left, more than 6,000 fans in Brick Breeden Fieldhouse threatening to blow the roof off, and their rivalry game lead slipping away, the Montana Grizzlies sprung their trap. 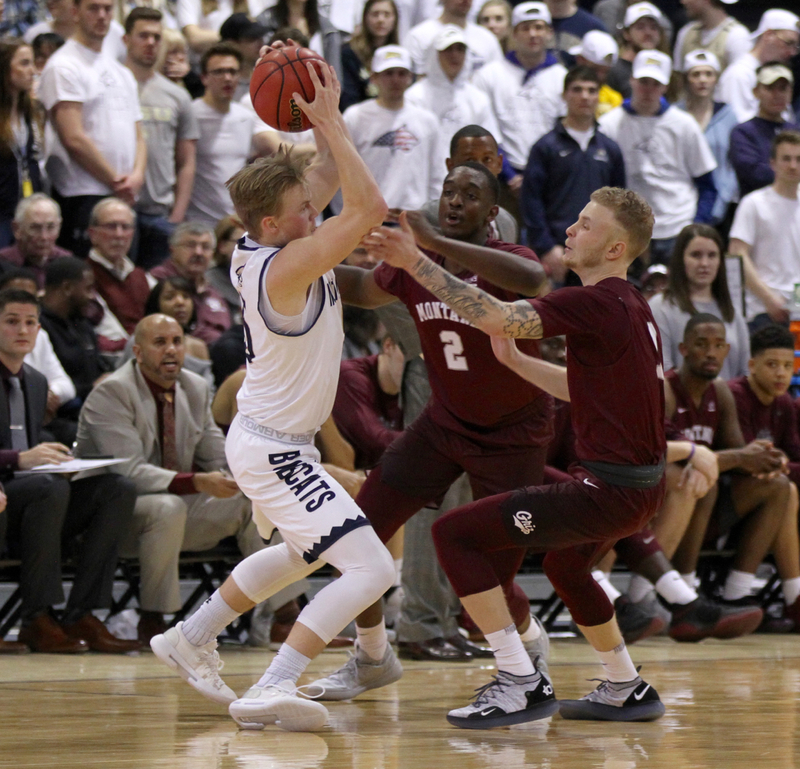 The Griz blitzed Montana State’s pick-and-roll, forced Bobcat point guard Harald Frey into a wild 30-footer with the shot clock winding down with less than a minute left, and escaped Bozeman with a back-and-forth 83-78 win in a classic Brawl of the Wild Saturday. 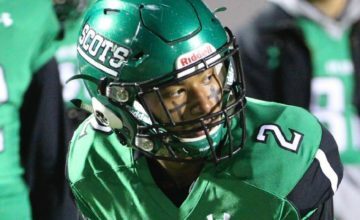 An incandescent, highlight-filled first half that saw Bobcats star Tyler Hall score 21 points in 20 minutes turned into a cagey, see-sawing second half. The Grizzlies shut down Hall for the last 20 minutes, holding him to five points in the second half, and relied on the veteran steadiness of Ahmaad Rorie, Jamar Akoh and Sayeed Pridgett down the stretch to — barely — pull out their 16th win in the last 17 tries against Montana State. Rorie scored 20 points, second among all scorers to Hall’s 26, and added nine rebounds. 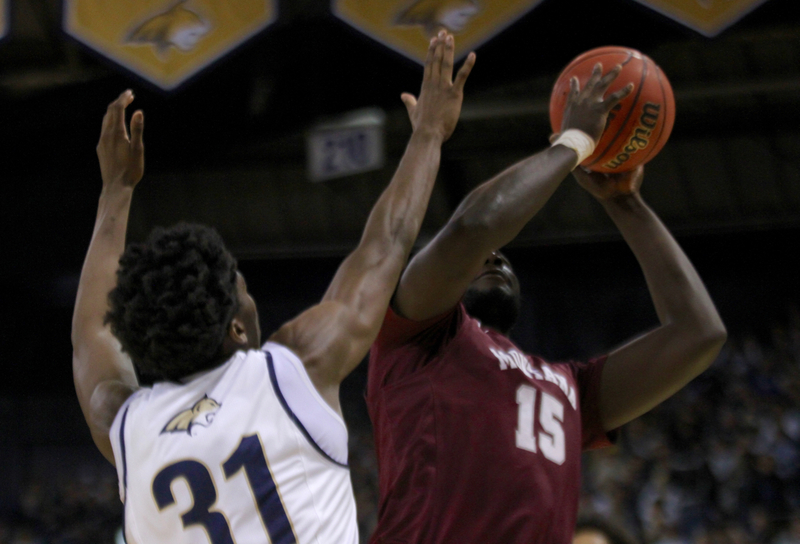 Akoh scored 10 of his 12 in the second half, and Pridgett, who played the last 7:34 of the game with four fouls, had several big buckets and passes late for Montana. The Grizzlies led by just two with 2:21 left after Frey, who finished with 15 points and 10 assists in a virtuoso passing performance, hit sophomore center Devin Kirby for a monster fast-break dunk that brought the loudest roar of the night from a season-high crowd at Brick Breedin Fieldhouse. After a timeout, Rorie missed a 3-pointer, giving the ball back to the ‘Cats with a chance to tie or take the lead. 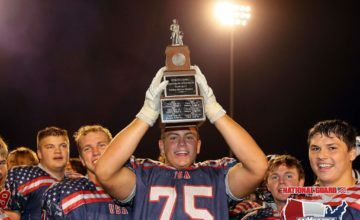 That’s when Montana dialed up the defense. Frey tried to turn the corner on the left side of the court, but Akoh blitzed the play aggressively, forcing the Bobcats to swing the ball around the perimeter until Frey, with bare seconds left on the shot clock, was forced to fire up a contested deep heave. 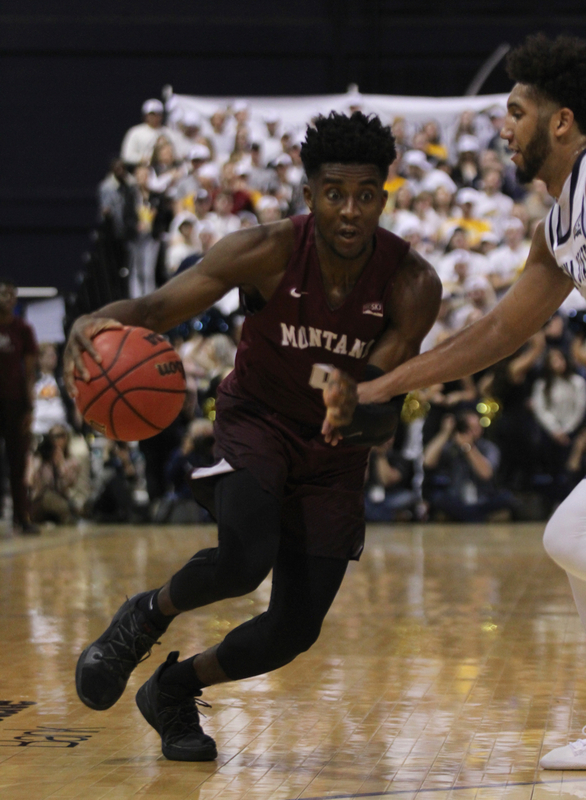 Senior Bobby Moorehead, who took the lead on shutting down Hall in the second half, chased down the miss, Pridgett scored in the post, and Rorie made his final four free throws to hold off Montana State, despite the Bobcats’ Ladan Ricketts making a 3-pointer to cut the deficit back to three points with 14 seconds left. The dramatic finish came after an incredible first half. The crowd, by far a season-high by nearly double for Montana State and fired up after the MSU women’s team blew out the Lady Griz in the early game 74-52, seemed to key the players on both sides to a fever-pitch start. 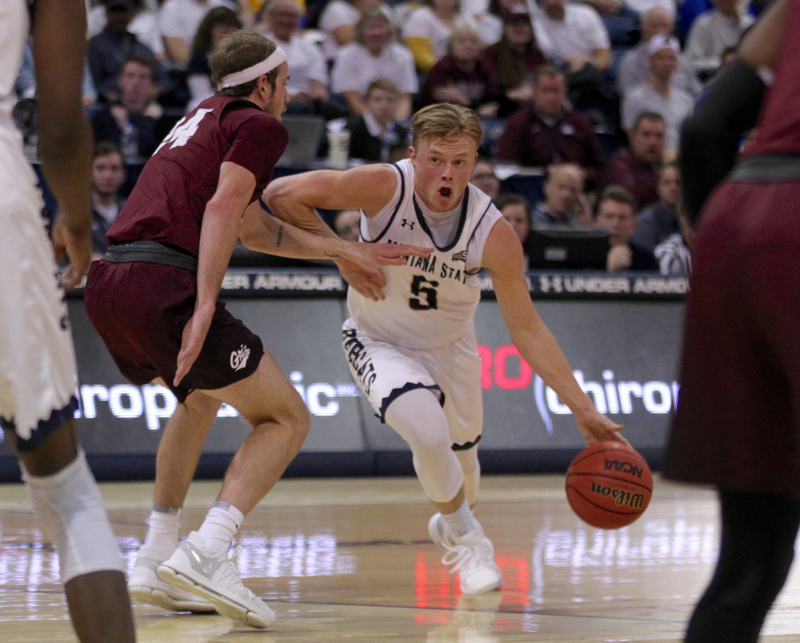 Aside from Hall’s scoring jag — he shot 8-for-13 in the first half, including a corner 3 with Moorehead in his face and a outrageous step-back over Rorie after almost losing his dribble — the Griz kept control as Oguine scored 14 of his 17 in the first half. 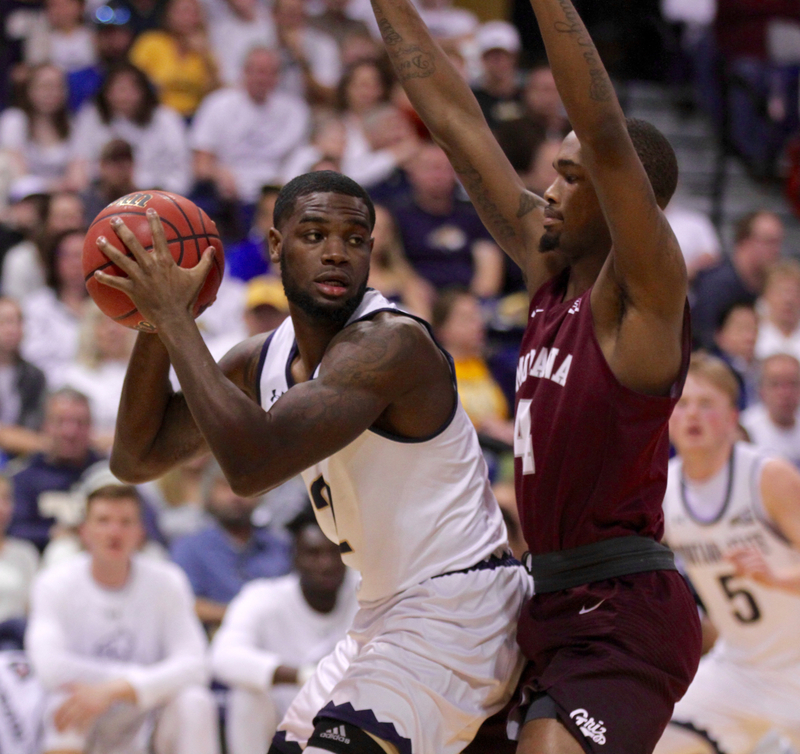 Rorie had 11 in the first 20 minutes, making 3-of-4 3-pointers, and Donaven Dorsey scored all 10 of his points in the first half for Montana, including an emphatic, one-handed poster dunk that seemed to show all the potential athleticism of the Washington transfer. In one delirious stretch that started with the score just 5-4, Montana State, with 16:55 left in the first half, Dorsey made a 3-pointer that was answered immediately by one from Montana State’s Keljin Blevins, then by two on back-to-back possessions by Rorie, the latter on a gorgeous behind-the-back feed from Timmy Falls. The end of the first half was even crazier. Montana tried to set up the last shot, but Frey stripped Oguine on a spin move and threw a pinpoint bounce pass in transition to Livingston native Ricketts, who sidestepped a defender and made a 3-pointer at the buzzer to give the Cats a 48-46 lead — their first since 8-7 — at the break. The teams traded leads over the first part of the second half before a decisive 8-0 run, keyed by one fast-break 3-pointer by Rorie and one transition 3-pointer by Moorehead, assisted by Rorie, gave Montana a four-point lead with 15:16 left in the game. Montana tied it back up and even took a two-point lead on two free throws by Keljin Blevins with 10:06 left, but Rorie tied it back up with two free throws of his own and then gave Montana a lead it wouldn’t relinquish with a beautiful hesitation dime to Akoh for a dunk a possession later, the start of a stretch in which Akoh scored eight out of 10 points for Montana. Montana State fell to 8-12, 5-5.